Your dentist cares about your health, and we know you do too! The challenge is, however, that while we may be interested in maintaining our health, many of us neglect proper preventative maintenance. Where oral health is concerned, preventative maintenance is a multi-faceted concept that begins with the choices that we make in our lifestyle every day. Preventative maintenance can be thought of as what you do to support your oral health between visits to the dentist. The first consideration is what we put in our mouths each day to fuel our bodies. Are we ingesting highly nutrient dense fruits and vegetables, or high fructose packaged foods? What we choose to ingest makes up the formula for how well nourished our bodies are at a cellular level. Vitamins like vitamin K, vitamin D and calcium are required in order for our teeth and bones to remain strong and healthy. Eating more nutrient dense foods rather than fast burning sugars and carbs is the first step to maintaining your oral and overall health. Another factor in our oral health concerns our lifestyle choices. Like food, choices like whether or not to partake of cigarettes, excessive alcohol or other highly acidic foods directly impact the health of our tissues. Other considerations include how well you are maintaining a clean environment for your teeth and soft tissues. Brushing your teeth twice daily and flossing regularly are critical components to stablishing and maintaining a healthy oral environment. Brushing and flossing helps to remove food debris from the oral cavity between meals and prevents the overgrowth of plaque bacteria. Neglecting an oral health routine can result in an overgrowth of harmful bacteria in the mouth and can lead to chronic conditions such as gum disease. If you’ve been making great lifestyle choices and maintaining your oral hygiene, you are significantly limiting your risk of tooth decay and gum disease – but does that mean that you should skip out on regular dental checkups and cleanings? Not at all! In fact, regular checkups and cleanings are part and parcel of your overall preventative maintenance routine. While you do your best to make healthy choices for your teeth and body, seeing your dentist is important in order to ensure that other less visible signs of concerns are identified and treated before they become an urgent concern. Your dentist’s job goes beyond just the teeth – dentists are trained to visually assess the structure of the teeth as well as to use other tools, such as digital X-rays, to identify concerns below the surface of the mouth. Your dentist is concerned with assessing the health of the tooth roots below the gums, the health of the lymph nodes around the jaw and neck as well as any other signs of emerging concerns such as oral cancers. Following your oral checkup, we recommend a professional tooth cleaning. While brushing and flossing daily drastically impacts the health and cleanliness of the mouth, naturally occurring minerals in saliva can calcify and, along with plaque bacteria, bond to the surfaces of the teeth. This naturally occurring process produces tartar – and tartar cannot be removed from the teeth with your tooth brush since it is too hard. Attempting to brush away tartar is likely to result in wear of the teeth and gums. Dental hygienists use their specialized instruments and training to safely remove tartar from the enamel without causing damage to the enamel of the teeth. Your dentist will take x-rays to check for infections and other potential issues to ensure you have a healthy smile! Checkups include an oral cancer screening to check around the mouth for abnormalities that may lead to potential issues. Keeping your teeth clean and ensuring that you do not have any signs of early onset of medical concerns shown in the mouth are good reasons to see your dentist, but did you know that your dentist can also help with diagnosing and treating other concerns? For example, many dentists identify signs of TMD (Temporomandibular Disorders) in patients who complain of jaw pain or sensitive teeth. This is due to a dentist’s ability to assess proper muscular and skeletal function of the jaw as well as microfractures in the tooth enamel that can be visible when grinding or clenching is occurring during rest periods. Similarly, complaints about snoring or halitosis (bad breath) can be discussed and remedied either by practical interventions, appliance provisions or referrals to medical professionals who deal directly with these concerns. 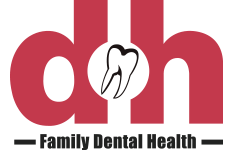 At Family Dental Health in Whitecourt, our goal is to partner with all of our patients and their caregivers in order to offer expert council, prevention and intervention where oral health is concerned. Each of our clients comes to us with a unique physiology, medical history and genetic makeup that can all impact the overall health of their oral environment. We are invested in the oral health of our patients and take a customized approach to each patient with excellent communication and an approachable bedside manner. All services provided by a general dentist.